At Legacy Capital Partners, we believe wholeheartedly in an investment philosophy and approach that strives to achieve the highest returns for the least possible risk adjusted total return. Our investment strategies are based upon the belief that a continuously managed portfolio of individual securities can earn a superior return on capital through market upswings and downturns, without placing undue risk on the capital base. While recognizing the importance of portfolio diversification, our use of individual securities avoids the costly duplication and lack of tax control in index and mutual funds. We are focused on managing risk and securities that outperform. When buying stocks, Legacy looks for value. The companies selected also must demonstrate outstanding growth potential, financial strength, a proven management staff, and a product or service with a constant market or a dominant leadership position in its field. We review the price of stocks on a daily basis, and at all times, we are careful to limit a portfolio’s portion of stocks to the client’s predetermined level of volatility. When buying bonds, Legacy looks to provide a reliable and dependable stream of income concentrating on preservation of capital within the context of total return. Whether government, corporate or municipal bonds are used, they must match our client’s objectives and have minimal risk when compared to the market’s expected returns. Utilizing credit research, sector analysis and interest-rate forecasting, we maintain a high degree of quality and liquidity in our fixed income investments so they may provide a source of funds for other investment alternatives. 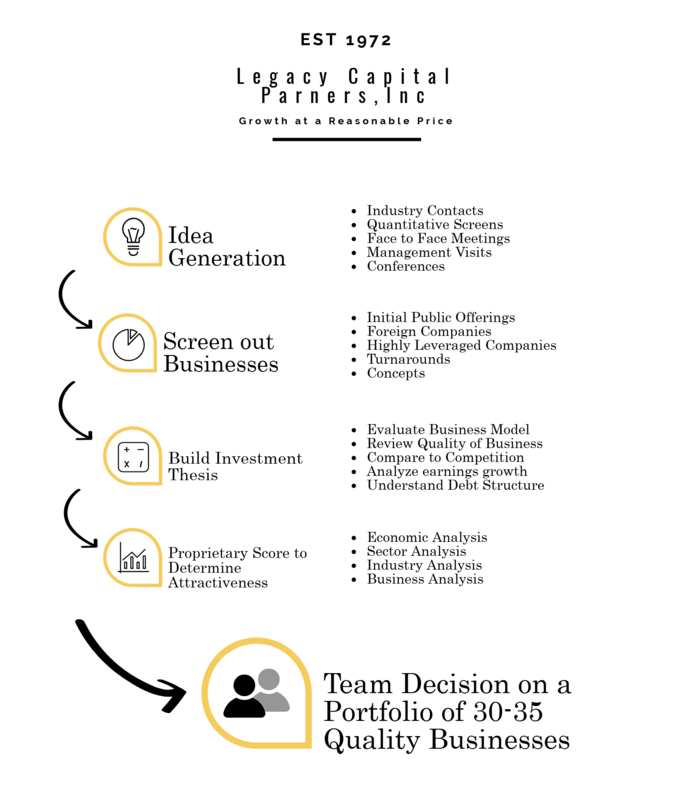 Legacy Capital Partners, Inc. may be the right choice for you. To learn more about how we can partner together, give us a call when you have a few minutes to visit over the phone. We'll answer some of your initial questions, collect some basic information, and set up a complementary consultation to help us all determine if our services are suitable for you. Our first meeting will focus on your needs and expectations. It will also provide a more detailed overview of our firm and philosophy. This meeting typically lasts approximately 45 minutes. If our approach meets your requirements, we would be glad to build a proposal specific to your unique situation. We look forward to the opportunity to meet with you and hope to extend our services in building a prosperous future together.